As Donald Trump put it “We already know Climate change is a hoax” but how far does his reach go exactly? Surely, the events of the past few days have given many opportunities for conspiracy theorists to thrive. One of them was maybe the strangest of them all. Badlands National Park`s tweets about climate change wouldn`t strike as extraordinary. Thousands of people read them, liked them and retweeted them. Which is pretty much common, as we are talking about the Twitter account of a National Park, after all. Now here comes the interesting part: all the tweets were removed by Tuesday. Is it a coincidence, that the National Park `accidentally` retweeted a picture about the turnout at the inauguration? Could it have been a technical error, which erased all those tweets? They happen to be about the very thing Trump wants to erase, so what? Does it also mean that there is a connection? I guess everyone has to decide for themselves. Those who know the answer wouldn`t talk, so it remains a mystery. Some claim that Trump even has power over climate change, or at least our perception of it. Certainly, it wouldn`t be the first time that those on power dictate what can be said and done and by whom. It doesn`t necessarily mean that it`s true. Nothing supports this theory, apart from the fact that White House climate change policies were also deleted on Tuesday. Could it all be coincidence? Or are the conspiracy theorists right this time? And what does this all mean? 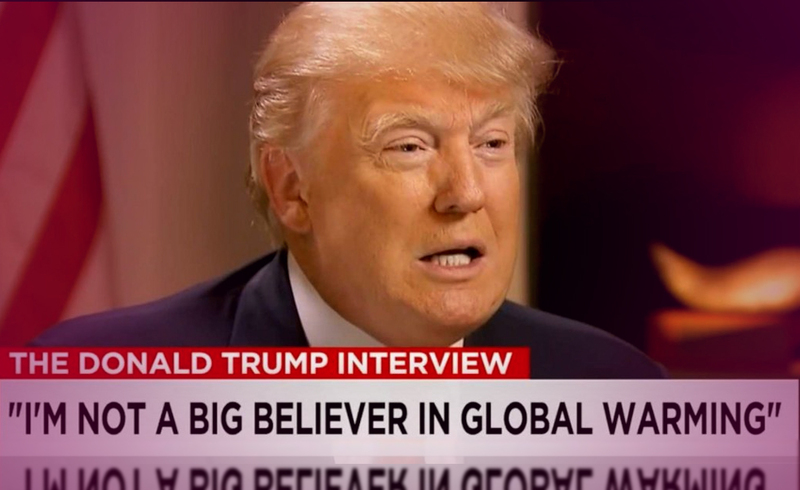 Trump might not believe in climate change, but that also doesn`t mean that it doesn`t exist. It also doesn`t mean that its effects on the environment and people isn`t a pressing matter. Let`s consult the cards to see whether Donald Trump`s views on climate change will change anytime soon. This card indicates struggle. Rather than a physical one, it suggests that Trump is struggling to maintain his position. He has made a decision in regards to this matter and doesn`t want to alter it, no matter what. His opinion is constantly being challenged, but he is holding his ground firmly. Trump needs to learn that some things are just out of his reach. There are outside forces in play, forcing him to re-evaluate his position. Sooner or later he will need to admit (at least to himself) that the truth might still be out there. Remember, there are always two sides to a coin (and a story). The wheel can also turn both ways, depending on those outside forces. This card would normally represent a person, and in this case I believe it refers to Theresa May. Her influence might just be the one to alter Trump`s opinion. I guess we will just have to wait and see, but I have a feeling that it won`t be easy. Previous ArticleWhy Did Taylor Swift`s Tweet Upset Fans?Next ArticleHow Does BREXIT Affect the US?